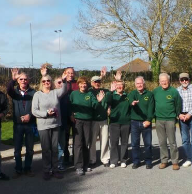 Parley Pétanque Club is based at Parley Country club which boasts over 600 members. We play all year but over the winter period this is restricted to Tuesday evenings from 18:30 and Saturdays from 13:30. There is a bar for occasions when the weather is inclement. Free qualified coaching is available to all members so why not join us we will always be pleased to see you. We have a good social life outside of the world of Pétanque. Browse our pages and make yourself known to us by visiting us on Facebook or by using our contact page.